Last week I was listening to a recent episode of the A Way to Garden podcast, in which the host Margaret Roach was talking to her sister Marion about what she’s dubbed “urgent garden questions.” Marion was saying that this time of year she spends a lot of time wondering if things are dead. This struck a chord with me, because like Marion I tend to be impatient, and I have a hard time believing that my perennials will have survived the winter. A few short weeks ago the garden was buried in snow. 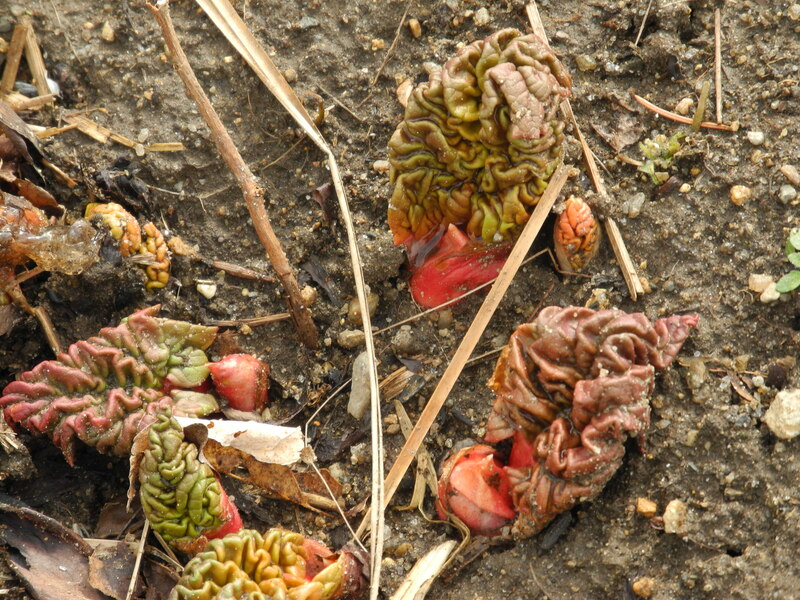 As soon as it all melted, I found myself staring at the bare ground looking for signs of life, as if the rhubarb was just going to shoot up out of the ground right before my eyes. 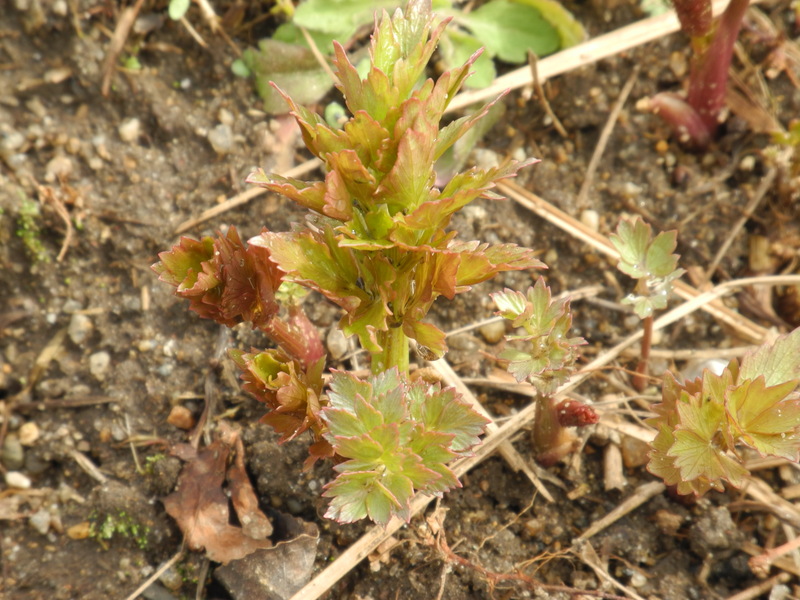 There was no sign of it at first, but sure enough after a couple of days, the tiniest little bit of red stem poked up through the soil, and now there are probably a dozen little crinkled leaves pushing up out of the ground. I planted my peas two weeks ago, and this morning I found that the first few sprouts had popped up. I can never quite believe that the peas are really going to sprout with the soil still being so cool this time of year, so it’s always a relief to see them coming up. 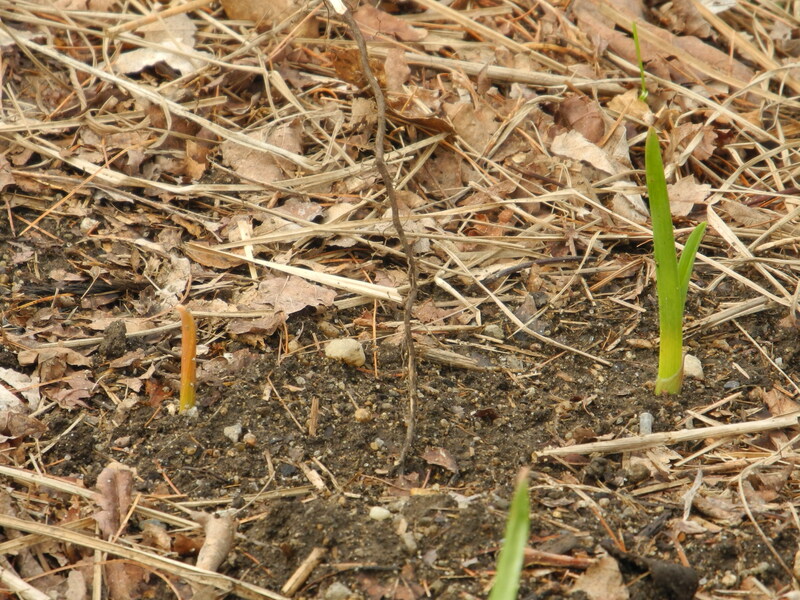 When I pulled back the mulch from my garlic beds a couple weeks ago the shoots that were coming up were pale and sickly looking, and there was no sign at all of one of the varieties. I was sure I had mulched them too heavily and that they had just rotted in the ground, but the plants are all looking healthy now and the even the ones I thought were dead have finally made an appearance. We had a good soaking rain yesterday, but now the sun is coming out and it’s supposed to be a pretty nice day. Spring has been of to a slow start, but I think the rain was just what the plants needed and now everything will really take off. Most of the perennial herbs are indeed still alive, and the peas and spinach and lettuce are sprouting. How is spring progressing where you are? Posted on April 13, 2013 by kate. This entry was posted in Gardening and tagged gardening, garlic, herbs, lettuce, Peas, perennials, rhubarb, spinach, spring. Bookmark the permalink. Nice post – we’re going through the same things right now. 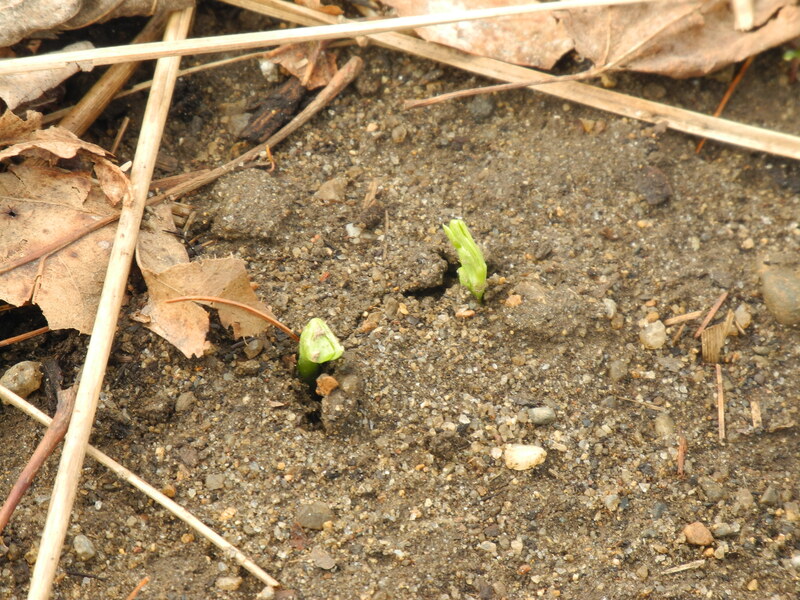 We’re hoping to see life in the asparagus bed very soon. Thanks Pat! I don’t grow asparagus, but I can’t wait for it to start showing up at the farm stands around here! We don’t have weather like you do but I really appreciate your photos. Thank you Tammy. Even though I complain about the winter weather, I do love seeing everything come hack to life this time of year. Enjoy the warm up! Spring will be in fast-forward mode this week! Yes, I think everything is really going to take off now. We’ll all be eating asparagus soon I hope! Seeing the rhubarb come through is one of my very favorite things every year. Mine too! It’s the first thing I look for when the ground starts to thaw. Yes! If there’s one thing gardening has taught me, it’s patience! The rhubarb and garlic are up here too, but the ground is still too wet to think about putting in the onion sets and planting carrots. The big suspense however is the asparagus. Four crowns were planted last season. There won’t be a harvest this year of course, but did they survive their first winter – will a few first spears appear..?